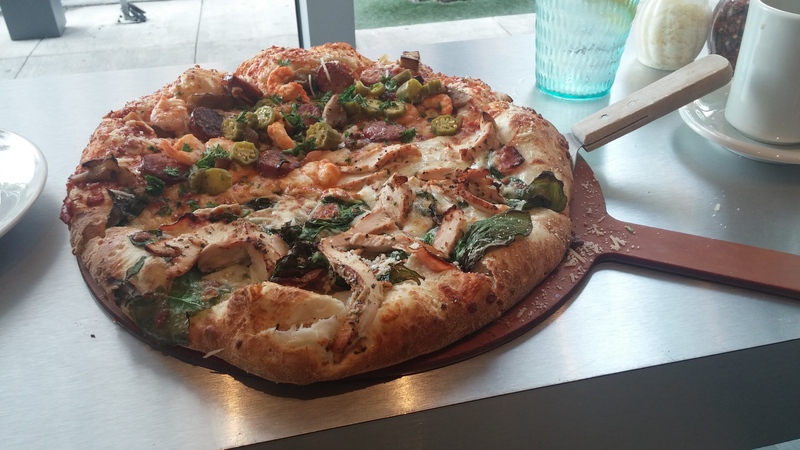 The pizza shown here is art. That’s all I can say. 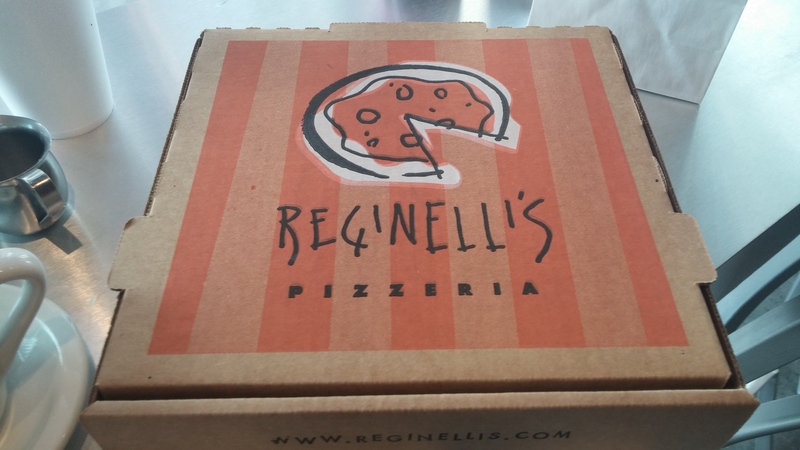 I have been waiting for the right time to talk about the first of several pizza places I visited in New Orleans. There is no right time, but I didn’t want to wait too long. And the Summer is always ideal. 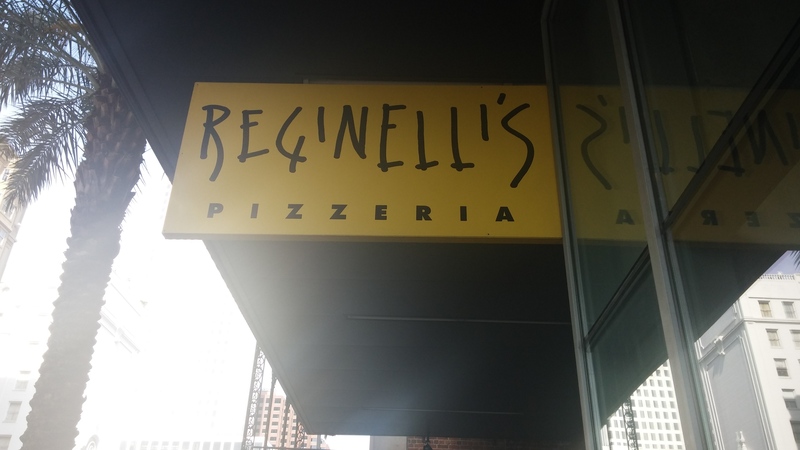 I have so much good to say about Reginelli’s that I’m freaking out on where and how to begin. Well I believe I just did! I need to write whatever I can to do this place justice. Plain and simple this is some of the best pizza I’ve ever had. One in particular was such a stand out, I was genuinely getting goose bumps while I was having this pie. About a month ago, I made my first ever visit to New Orleans, and of course I enjoyed as much as I can in the limited amount of time. I did a lot of sight-seeing, a lot of eating, a lot of drinking, and a lot of living. 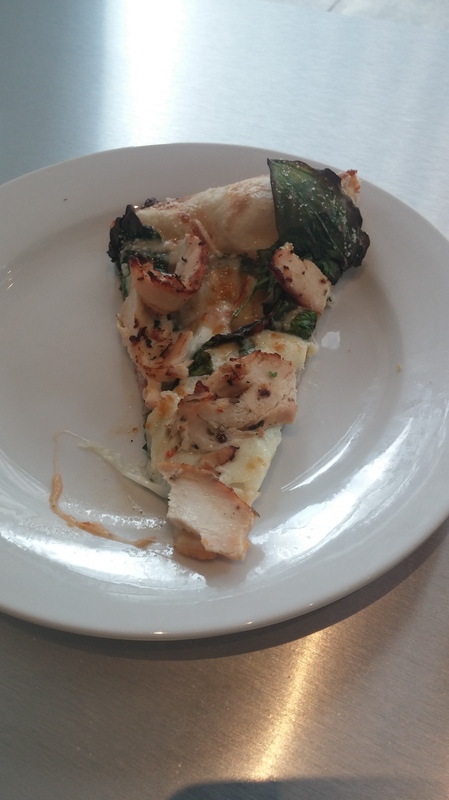 I had researched a few pizza places I wanted to visit, for this blog. And I did get to a couple of those, but the best things in life tend to happen unplanned. And this is what happened here. After a day of exploring I found myself in the Central Business District just strolling along with no worries, no headaches, and no sense of direction. That last part is not a negative. It’s good to get lost in a place you’ve never been. These are the events that make you stronger and are so liberating. As I’m walking along I see this charming storefront and I also see pizza! Whatever fate had in mind for me, I was meant to eat here. And eat here I did. I also ended up staying for a couple of hours. More on that shortly. The staff could not be more welcoming. 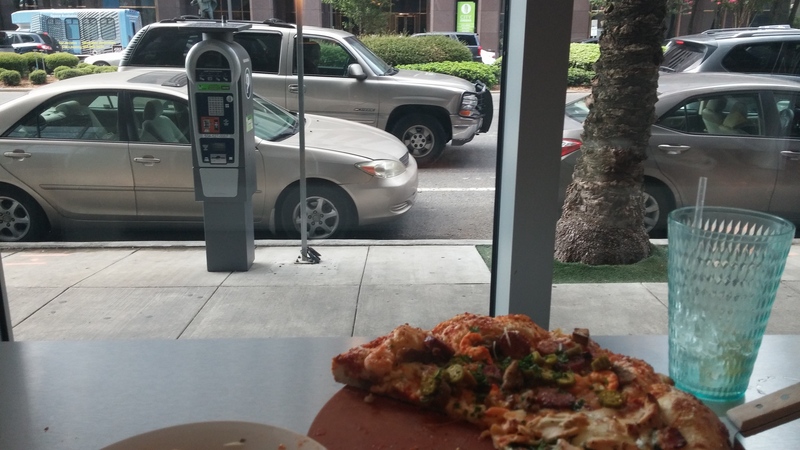 I had a nice view of downtown NOLA as I had a cup of coffee, yes coffee, and a glass of water before I was ready to order. They told me take all the time I needed. It wasn’t too busy in there but I appreciate the sentiment. And they were sincere about it. I felt so at home and like a regular. Maybe in a previous life? 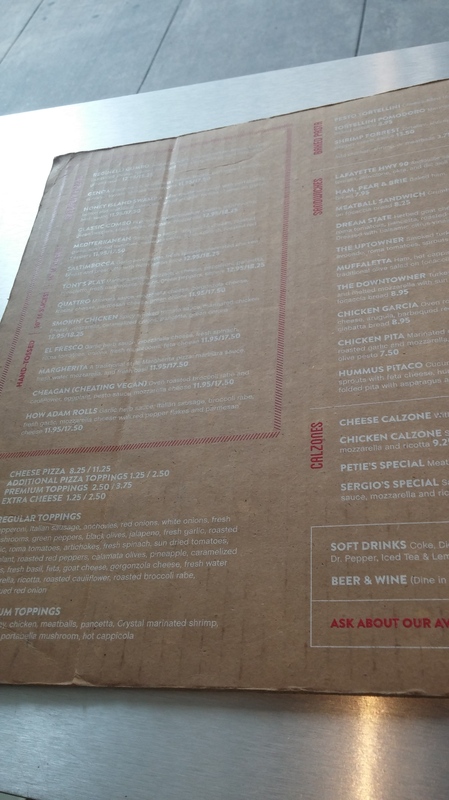 I love their setup, I love their menus, I love everything about this place. The interior felt so cozy and so welcoming. I didn’t want to go anywhere. It’s like I belonged here and in this city. It was my last day here and this experience will always resonate with me. This was quite the way to go out. After everything I just got overly sentimental about, how was the food? There was so much on the menu I wanted to devour, but I could only get one pie. And a small, personal pie would most likely suffice. The friendly server who waited on me, Danielle, was so kind and so helpful in her suggestions. 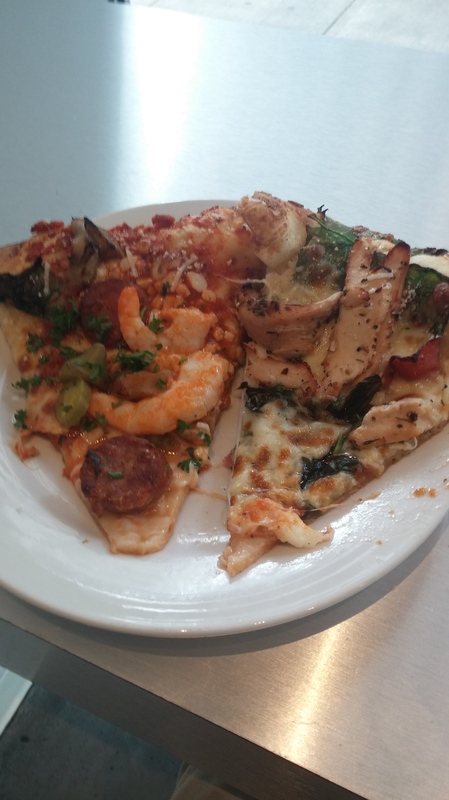 She said I could do a half-and-half pizza. 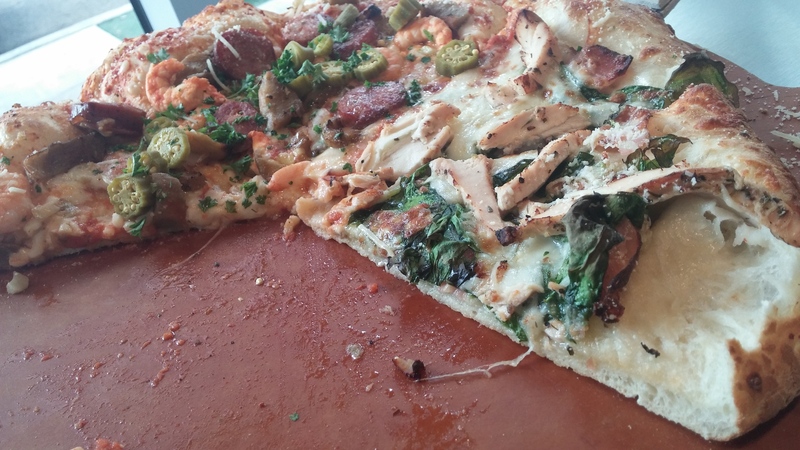 Funny, that months into writing about these pizza joints, I never thought to do that. Well here we go. 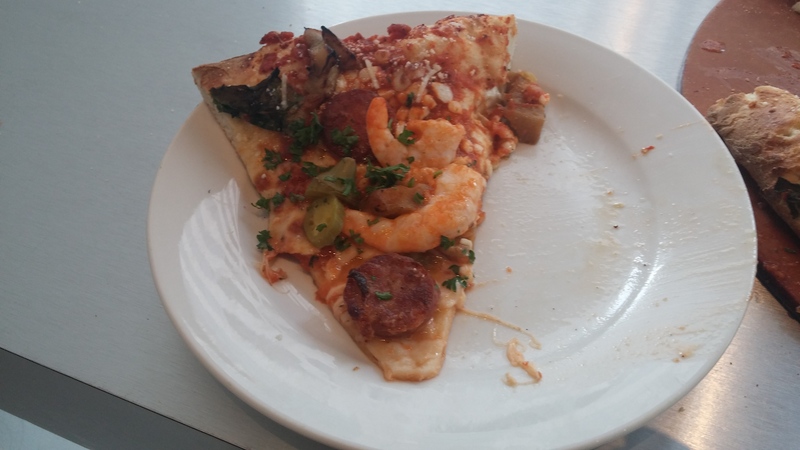 As a first timer, I went with the Gumbo, which includes andouille sausage, spicy smoked tomato sauce, crystal marinated shrimp, roasted eggplant, holy trinity and pickled okra. That’s a lot to digest I know. No pun intended. The second half was the Saltimbocca, which has garlic herb sauce, fresh spinach, marinated chicken breast and prosciutto with fresh lemon juice. Can you guess which one really hit a nerve? Ironically it was the latter piece. The Gumbo was very good but there was a lot of moving parts that it felt too much to eat all at once. And this is meant as high praise It was scrumptious. 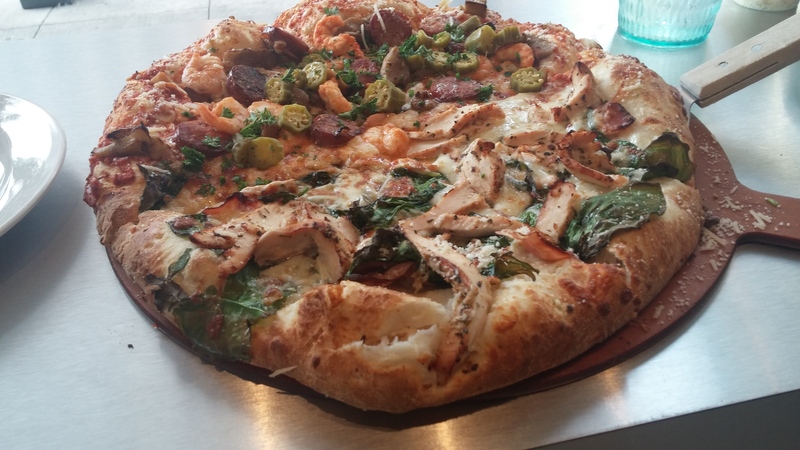 The toppings, the sauce, the cheese, and the crust were cooked to perfection. It just seemed a bit rich and hearty for me. 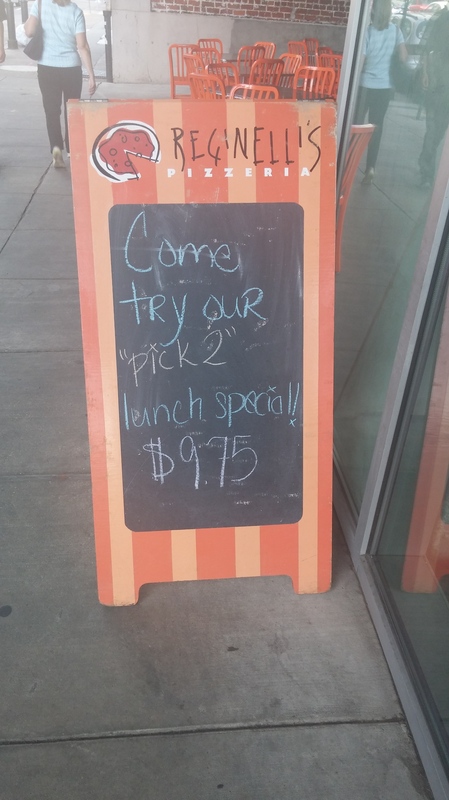 That’s not to say I wouldn’t eat again. But, I need to talk about the Saltimbocca. I could dedicate an entire thesis on this one. This is how a pie is done. All you need a is few ingredients, the right temperature, and the right soul behind it, and you have a winner. The lemon juice really put it over-the-top. I would have never thought to put that or have that added to my meal, ever. It’s such a simple and healthy that I no longer want to take for granted. The presentation was also out-of-this-world, I wish I could throw up a hundred pictures. The display is sometimes just as important as the pie. I mean you’ve got to be kidding me? This is incredible. And speaking of not taking anything for granted, I want to thank Danielle for being so kind in allowing me to take pictures and getting her blessing to do a write-up on this place. I think this is the first time I felt so comfortable talking about my blog to the actual spot I was writing about. In addition, they accidentally gave me a large but charged me for the price of a small. It’s the little details that I wanted to mention as well. They didn’t have to do that. But it’s the sense of family and community I got in there that makes me want to come back. Maybe I just felt at home, maybe its being on vacation, maybe New Orleans just hit me on a very spiritual level. I can’t wait to go back. I miss this city so much.